Medvedev’s party reform: concession or convenience? One of the more obvious achievements of the protest movement in Russia was their sucess in forcing a change in the regulations for registering political parties. In 2005-2011 there was no freedom for political associations: the number of parties dropped so low that in 2009 there were only seven left, or six if one excludes the ruling party ‘United Russia.’ These few parties were the only political parties that were allowed to operate legally, and to take part in elections. New parties were forming all the time, but they were consistenly refused registration. Moreover, the six ‘legal opposition’ parties were constantly under threat of having their licence revoked for one reason or another, so they were effectively under government control. This had the effect of undermining the confidence of voters who might have sympathised with the opposition and was the main framework of the executive’s political monopoly, with ‘United Russia’ as its vehicle. Constitutional freedom for political parties was, naturally enough, one of the protesters’ main demands. In the event, the authorities acceded to it quite easily: in his December 2011 message to the Federal Council President Medvedev announced a programme of political reform, the first point of which was that party registration would be considerably simplified. Later, official government representatives denied on more than one occasion that political reform had been a concession to the demonstrators, maintaining that the programme had been in preparation for a long time. Statements such as this are difficult to take at face value: suffice it to say that the reforms to the electoral system proposed by Medvedev have been revised twice since December and the draft law which has been sent to the Duma bears almost no relation to the initial proposal. Even if someone in the presidential administration had sketched out some analytical first drafts, which subsequently formed the basis of the reforms, it is perfectly obvious that it was the terrible results in the December election and the ensuing demonstrations that meant the ideas have come as far as draft law stage. But political reform should not be interpreted as a unilateral concession on the part of the authorities. They discarded the preceding model not only because they were scared by the mass protests, but because that model was no longer fit for purpose. This is particularly true of the party system. The first thing to remember is that the institutions of party democracy have always played a modest role in Russian politics. The constitutional order established in Russia in 1993 concentrated most of the power in the hands of the President, who throughout the post-Soviet period has either remained outside a party (Boris Yeltsin) or been the central figure in a party designed to support him (Vladimir Putin). All the parties had to do was form the political structure of representative bodies at federal and regional levels. These bodies always had very limited powers: they had no real chance of influencing the decisions of the executive or moving their candidates into managerial positions, so they never had any authority in society and found it very difficult to move forward. It is hardly surprising, therefore, that even before the system made its final swing toward authoritarianism in the middle of the 2000s, the inability to create a stable party system was considered a major failure of Russia’s embryo democracy. After the swing, Russian parties were doomed to fulfil the functions usual for electoral authoritarianism. These had, of course, nothing to do with the alternation of parties in government, which is the raison d’être of the party system in a democracy. Instead, they were assigned the task of mobilising electoral support and ensuring that the majority in any legislative assembly toes the government line. Second, the public procedure of the elections was manipulated to confirm an idea that the colossal level of support for the existing government is proof positive there can be no alternative to it. The third function is one of coopting or integrating into the authoritarian political system any politician or public figure that might be a threat to the status quo. 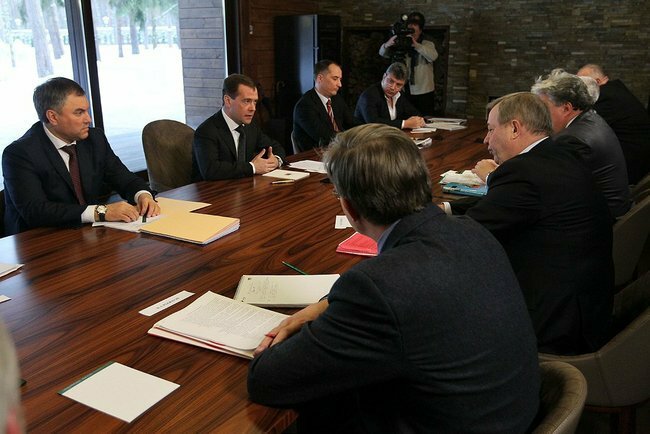 President Dmitry Medvedev meeting with the representatives of unregistered political parties (Feb.20, 2012). The meeting was attended by leaders of the ‘non-system” opposition such as Boris Nemtsov (co-chairman of the People’s Freedom Party) and Sergei Udaltsov (Left Front). Only a few months ago this kind of event would have been seen as political fantasy (photo: PARNAS party web site). The events of 4 December and afterwards demonstrated that the party system formed between 2005 and 2011 had not been equal to any of these functions. ‘United Russia’ did achieve an absolute majority at the parliamentary election, though it was a weak and unconvincing majority: a significant part of society concluded, with complete justification, that this majority was achieved only through mass electoral fraud. As a result, the signal transmitted to the Russian elites and the masses, as well as the international community, was exactly the opposite of what was intended. Why did this happen? The authorities calculated that the ‘legal opposition’ parties were unconvincing and unable to mobilise the support of anyone but their ‘niche’ social groups, meaning that the ruling party would automatically achieve a majority because there are no acceptable alternatives. However, this strategy, which for several years had worked in both federal and regional elections, was undone by Aleksei Navalny’s campaign ‘Vote for any other party but United Russia.’ This campaign made it clear to critically-minded voters that the government could not be beaten according to the rules it itself had created, but these rules could be circumvented by voting strategically – not ‘for’ an unconvincing opposition, but ‘against’ the government. All the parties increased their share of the vote in this way, whereas ‘United Russia’ failed to achieve 50%, even in the official figures. Even more dangerous for the government was a trend that emerged from the protest movement after the elections. This movement was to a large extent spontaneous, but it was quite clear that nothing would have happened if the leaders had not organised demonstrations, made speeches at them and mobilised supporters etc. It became apparent that there was quite a range of politicians outside the organised party system who represented a significant threat to the government. In other words, the party system had failed in the cooption function as well. Since it had proved unable to carry out any of its functions, it was in the interest of the authorities to change it. It was, therefore, quite natural that party reform was the first of Medvedev’s proposed reforms. It was implemented rapidly (the law has already been passed) and in a fairly radical form. The main programme point was the reduction from 40,000 to 500 of the minimum number of members needed to register a party. Moreover, the government was extremely insistent that this number, which had been announced in December, remained unaltered during the course of the bill’s passage through parliament. For reasons of their own the ‘legal opposition’ parties were demanding that the number be raised to 5,000, 10,000 or even 20,000 and critical voices were raised in ‘United Russia’ too. But the government, relying on its loyal majority in parliament, stuck to its guns and kept the figure of 500. The law was originally to have come into effect on 1 January 2013, but this date disappeared from the final version and it will now go on the statutes as soon as the legislative process is complete. The authorities are obviously keen to see considerably more parties in Russia and that this should happen soon. Why? It stems mainly from a need to co-opt more players: electoral considerations are not a strong enough incentive because the next general election is not until 2016. There are only a few elections for legislative assemblies scheduled, because they took place in 27 regions at the same time as the parliamentary election in December 2011. This means that realistically any new parties will only acquire electoral significance in 2014. But the cooption question needs to be addressed immediately. There are good grounds for expecting socio-economic tension to start increasing as early as autumn 2012, so by that time any even half-way significant organised opposition must be incorporated into the system. But why, then, is the government interested in increasing the number of parties? Firstly, the relative simplification of registration will stimulate any fairly high-profile politician to set up his own party. As a resource, parties are useful for organising relationships with other members of the opposition, as well as increasing media influence. But an opposition broken up into dozens of badly-organised small parties is hardly going to represent a threat and each new party will have to distinguish itself ideologically from the others, which will make it very complicated for parts of the opposition to set up coalitions. The authorities hope that for quite a long time all opposition forces will be frenetically building up their parties, which will leave them no energy at all for actual opposition. We could call this ‘negative cooption’ i.e. drawing them into the system by giving them an incentive to stop working against it. Secondly, however, there is what I call ‘positive cooption’ i.e. an inducement to enter the system by accepting its rules. The new law on parties does indeed simplify the registration procedure, but it in no way eliminates government opportunities for manipulating that process. 500 members can quite easily be signed up, but the Ministry of Justice instructions leave their officials multiple ways of refusing registration for other reasons: some irregularity in convening the inaugural congress or one of the regional conferences, a programme or charter at variance with one or other law. Parties were actually refused registration for these reasons, rather than insufficient member numbers, before the reforms. Now the door is open, as it were, but only players who can assure the government they are relatively harmless will realistically be able to avail themselves of the opportunities this offers. For anyone unwilling to provide this guarantee the Ministry of Justice will have a whole armoury of possible injunctions. 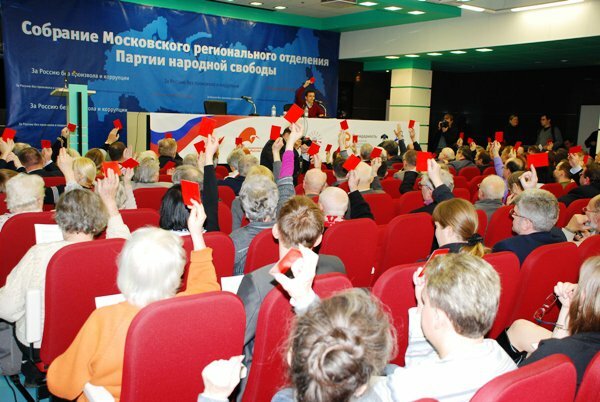 The meeting of the Moscow organization of the People’s Freedom Party (Parnas), Feb.2011. Russian opposition politicians are rarely able to forget personal ambition and unte before an election, but this time they agreed to act together. Their attempt to register the party was rejected on formal grounds (photo: kremlin.ru site). It should also be noted that the new parties will not only consist of opposition groups, for there will also be organisations under the thumb of the government. These flourished in Russia before 2005 and there are no reasons to assume that the new law will not stimulate a mass renaissance of such organisations. But here we pass from the cooption function to the possible electoral goals of political reform, though, of course, these goals will not necessarily be relevant at the appointed time. By the time any particularly significant election is due to take place the new laws will quite possibly simply have been repealed. We should not, however, exclude the possibility that government strategy is more long-term. Will the authorities be able to control the legislature as they did before – primarily the State Duma – in the new party system? The fact that we already know the system that will be used for electing parliament has an important bearing on our answer to this question: a proportional, closed-list system in a single nationwide constituency with a 5% threshold. Only parties with approximately 5 million voters will be able to pass this threshold and the draft law on parliamentary elections does not allow for pre-election coalitions. It also requires each party to nominate for the list only its own members or non-party members, not members of other parties. The new party law in its turn makes participation in an election a condition of survival: if they fail to enter an election, they lose their registration. The calculation is thus that parties will register in great numbers and independently take part in elections, though only a few big parties will have any chance of attaining the threshold. ‘United Russia’ or its successor, a new ruling party, will certainly be among that number. Experience has shown that, even in extremely unfavourable circumstances, the ruling party can garner 35% of the vote through administrative voter mobilisation. Given the electoral system, this level of support could well be converted to a majority of seats. In order for this to happen, the remaining parties that have cleared the barrier must all together win less than 35% of the votes. Then the government has only to ensure that the remaining 30% is distributed among parties that do not attain the threshold and the political monopoly will be preserved. The 90s and early 00s saw an abundance of these organisations. The ‘splitters’ take away votes from one or other opposition party, although as a rule these votes are not sufficient to get past the threshold. The aim of the ‘spoilers’ is less to do with getting votes themselves: they use negative campaigning to hit the success rate of one or other opposition party, either by dissuading voters from turning out or persuading them to vote for parties who clearly have no chance whatever of passing the barrier. Thus the new party law and the electoral legislation combined create a situation in which the political monopoly can be maintained, in spite of the highly fragmented party system. The simplification of the registration process is, however, a significant victory for the democracy movement in Russia. Yes, the government will still be able to keep control of the situation under the new legislation, but it will be more difficult for it to do so and there are more chances that at some point it will fail. To a large extent this will depend on the opposition: can it once more impose its own rules on the government, or will it just obediently toe the line?